Protection for over one year! 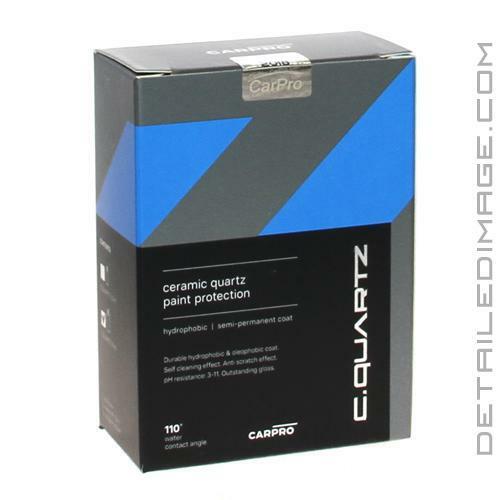 If you are looking for more protection than any sealant or wax can offer the CarPro Cquartz Ceramic Quartz (tio2) Paint Coating is exactly what you are looking for. This special nanotechnology doesn't create a temporary barrier, it's a permanent coating that will protect your paint for years, not weeks or even months. Apply it to the paint, clear coat, glass, plastic, wheels, rubber trim and more for an incredible level of protection. The ceramic nano particles and silica mixture modify the surface at the molecular creating protection that is HydroPhobic so water and contaminants can not bond to it. Best of all the "Anti Calcium Effect" can help repel water marks that leave nasty stains behind. Don't forget about the shine as well, because the gloss level is incredible. You'll enjoy looking at the fresh and glossy finish for years to come. It is UV stable and it can not be removed by strong shampoos, pressure washers, etc. Over a couple of years the coating will eventually fade or you can remove it by polishing but otherwise it's there to stay. Before applying it you should thoroughly wash the surface with the CarPro Iron X Iron Remover and the CarPro Tar X Tar & Adhesive Remover, which removes the really stubborn contaminants. Next polish the surface to remove oxidation and swirls and then use the CarPro Eraser Intensive Oil and Polish Cleaner to remove any oils left behind by a polish. When you are done you'll be stunned by how outstanding the paint looks and how durable the protection is. 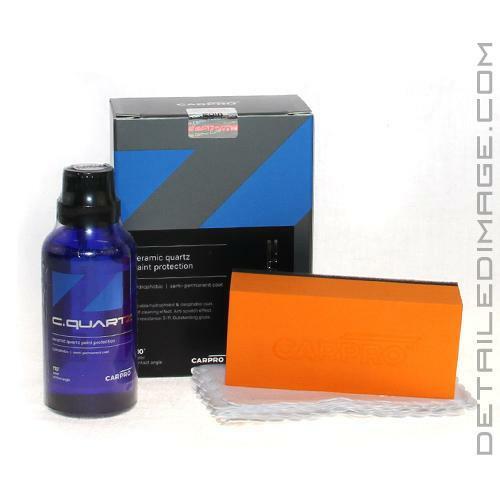 Take your paint protection to the next level with the CarPro Cquartz (tio2) Ceramic Quartz! Comes with: 1 applicator, 5 suede cloths, and 2 hologram stickers. Works great when applied with the CarPro Suede Microfiber Cloths! Bottom line, CarPro Cquartz is a great product that needs a bit of a learning curve initially, but provides great looks and protection. Durable hydrophobic & oleophobic coat. Prepare & clean the surface free from all oils. Pour a few drops on the suede wrapped applicator. Apply in crisis-cross pattern section by section. Let dry for 2 to 5 min. and do not wipe off until you feel a slight resistance to Microfiber wiping. Wipe off using short loop MF. Touch dry in 1H. Full dry time with NO rain 48H. Application couldn't be easier. I was a bit nervous applying to my new vehicle but working in 2x3 areas made it simple and the time allowed to do the final wipe flexible. You can work a small area or a big one and come back to do a finial wipe. Much easier than other brands that need removed quickly or they leave behind streaks. It also added depth to the shine of new paint. Now that's impressive! I use this over finest as a topper and I've never seen beads that are tighter. It's the highest surface tension I've ever experienced. No cons whatsoever. My shelf is always stocked with at least 10 of these at all times. I recommend this product to the beginner auto detailer and pros alike. Really easy usage. Crosshatch on, wait a couple minutes depending on ambient temp and wipe it off. I loved this product! Very easy for application and the results are amazing! After properly prepping the vehicle (clay, compound, polish, and alcohol bath) the paint glows and the hydrophobic properties are crazy!